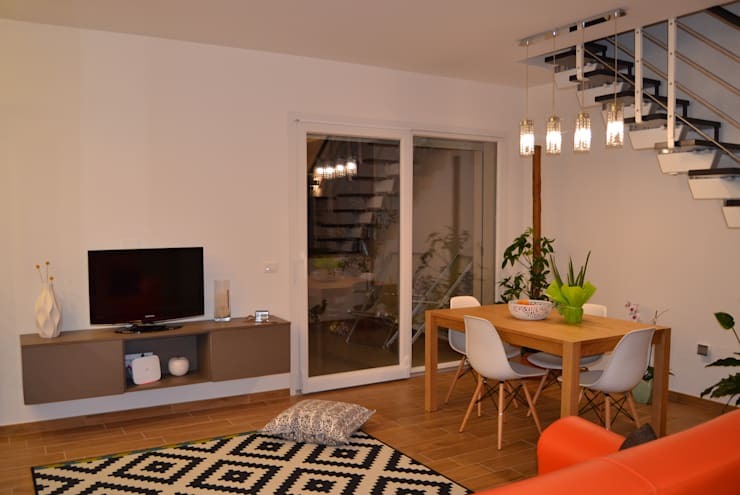 So you have a small home and you aren’t quite sure what to do about décor and furnishing. Too much furniture and the room will look untidy and cluttered… too little furniture and the effect will be stark and boring. And what about colour? 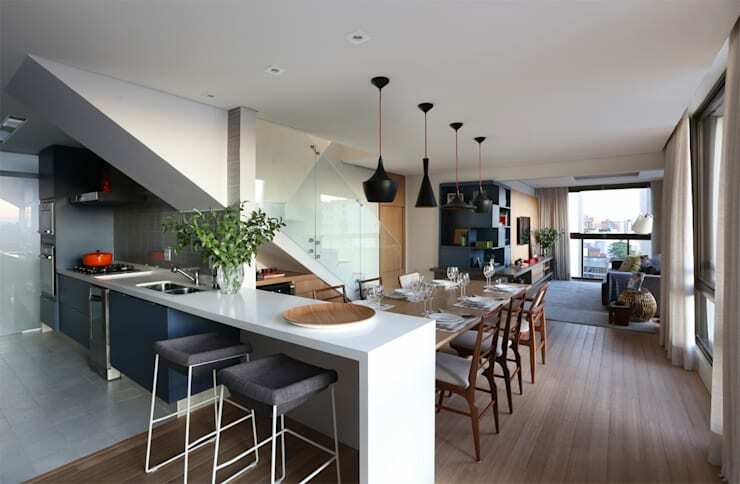 How can you incorporate your favourite colour into the home without it overwhelming your space? Well, in this Ideabook we tackle all those aspects of décor and design, to ensure that your home looks and feels a lot more cosy, welcoming and comfortable. These 13 tips and tricks will inspire you to create a stylish and inviting home, let’s see how! Comfortable earthy tones are an excellent way to add style and elegance to a small home. The colours enhance an effect of serenity, making socialising and entertaining an easy task. Go for some wooden furniture and white walls to accentuate the lighting in the room. 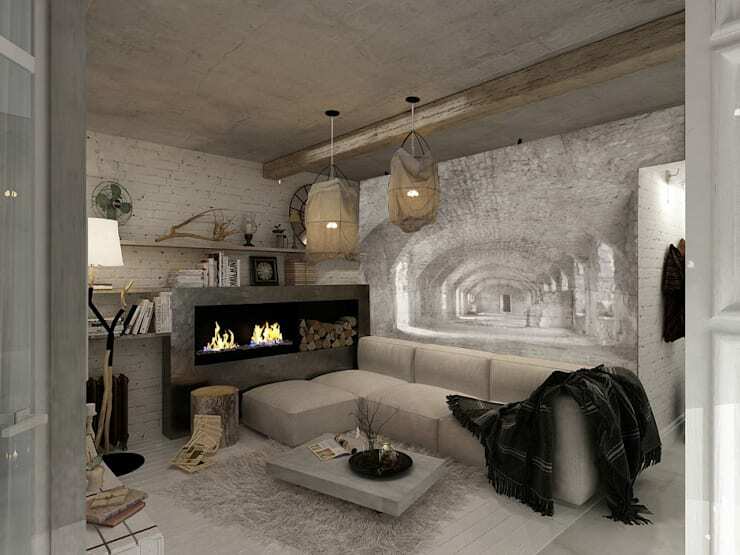 Muted tones of beige conveys warmth and modernity too. The best way to add some style to your small home is to think about accessories and elements that create a tranquil environment. Think of using neutral or light shades as well as simple textiles and florals, plaids or stripes for an exquisite effect. Rugs are a great way to incorporate warmth into a home, while also creating a welcome environment. Natural light creates a cosy environment and you interior designers recommend neutral colour furniture. This can be integrated with a vibrant colour for an effectively attractive décor. Mirrors are an awesome way to enhance the space in a small home, but remember that placing mirrors opposite natural light or brilliant lighting will accentuate the illumination of the room too. A floor to ceiling mirror adds a dramatic effect to a room, and when paired with vibrant colours such as yellow, the room is even more fresh and fantastic. Art is another awesome way to display your unique character and personal style while creating and elegant and sophisticated atmosphere too. It’s amazing what a cheerful colour such as yellow can have on the home, it represents the mind and intellect, but also has a beautiful tone. The colour will get you going if energy is what you lack every day. 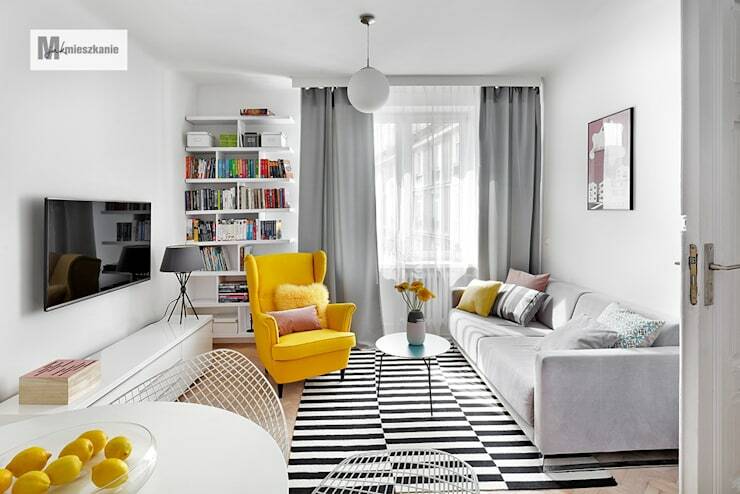 This living room with its combination of grey, monochrome stripes and a yellow accented seat is a great way to begin your morning. The dining room should be a harmonious addition to the rest of the décor. Which is why the choice of table and chairs is imperative, along with the combination of textiles and materials incorporated into the room. 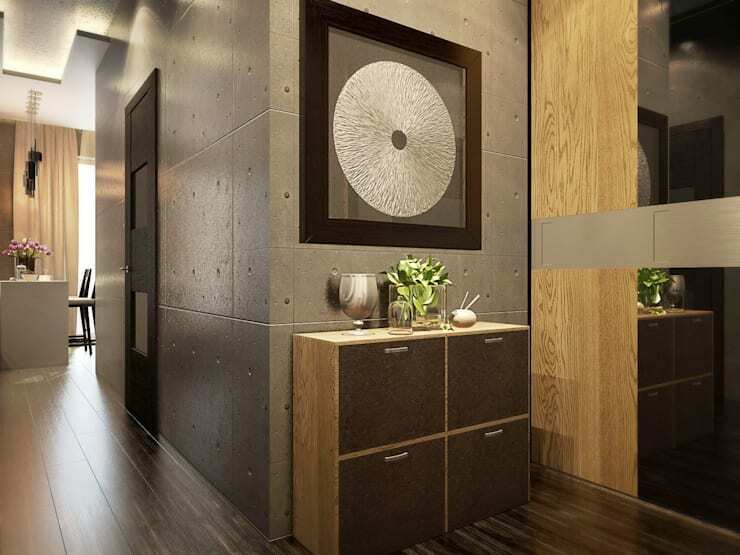 Opt for features that blend well with each other, as well as a colour choice that is neutral, calm and cosy. Overwhelming your dining room with colour and odd patterns is never a good idea. If you’re looking for furniture ideas that add an attractive effect to your modern home entrance, then consider a statement making side table for a special personal touch. This feature is an excellent spot to leave your keys, handbag or even lunch, so you’ll never forget anything on your way to work. A mirror is a great addition too, fix your hair or makeup on your way out and you will always have every hair in place. 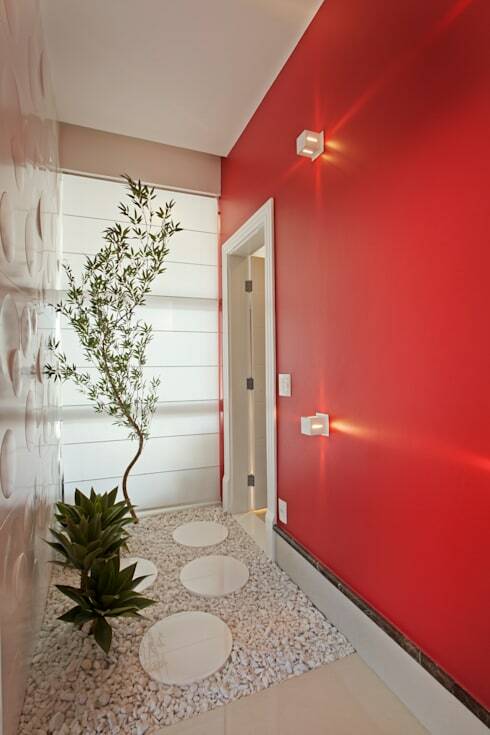 The hallway to your home should have a fresh environment, and this is usually only possible with the tranquillity of brilliant natural lighting and some gorgeous greenery. This interior garden along with its white stone floor and versatile environment is a comfortable and modern addition to the home, with a sensational and impressive detail that will impress your guests. 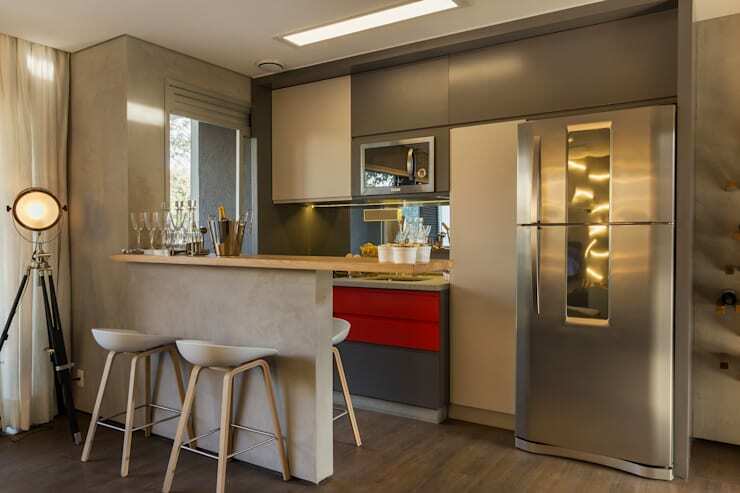 Neutral tones in the kitchen are a great way to keep the space looking trendy and tasteful for years to come, but that doesn’t mean that you cannot combine some elegant shades with a colourful accent for a sleek and stylish effect. Opt for some earthy cream or grey with red or yellow and let your personal style shine through. The ultimate kitchen will have gorgeous lighting to create a warm ambiance too, so bear that in mind during your planning process. 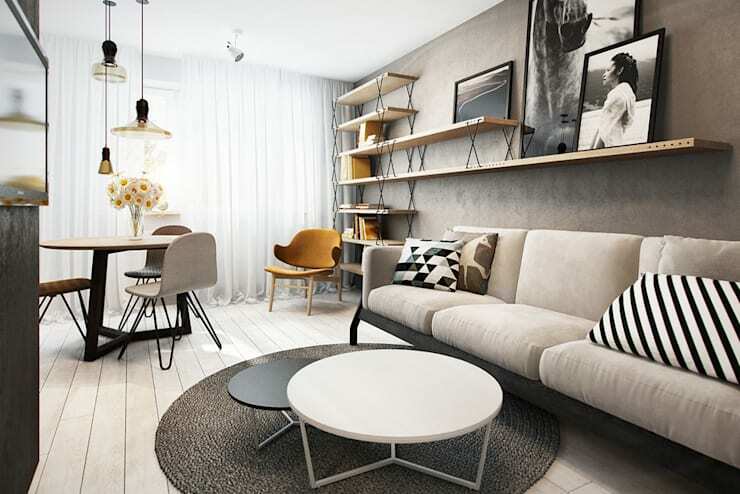 If you’re lucky enough to have a balcony or terrace area as part of your small home, then this is a great way to add chic style and elegance to your living space too. 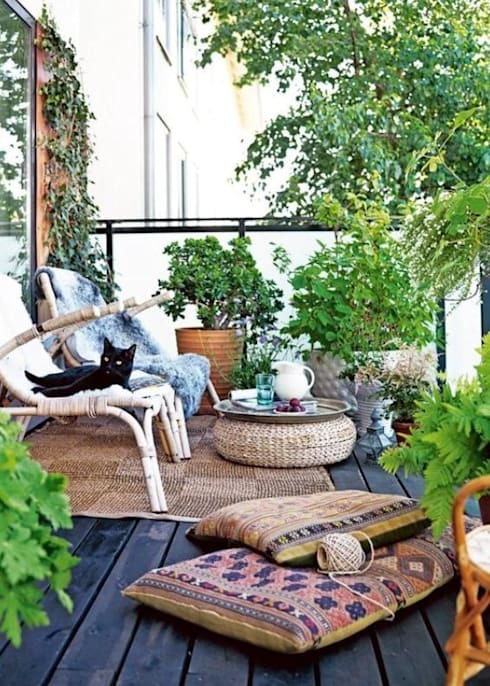 Allow yoru outdoor area to become an extension of your living space, add some comfortable seating, décor elements and natural fibres and textures making this fresh air loving environment a usable space. For humans and cats alike! 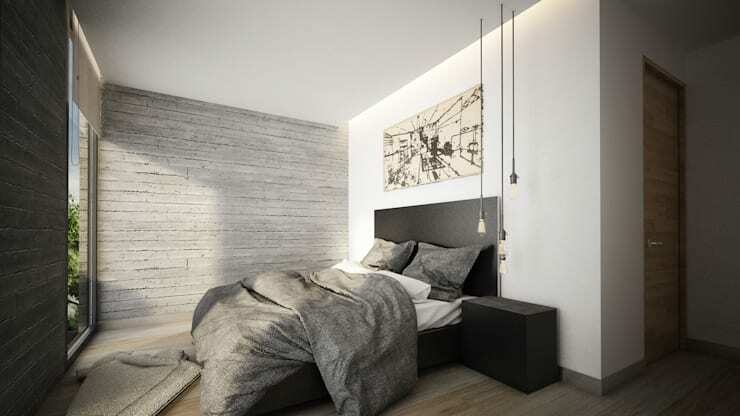 The bedroom is elegant and sophisticated with shades of grey and white creating a comfortable slumber loving environment of peace and serenity. 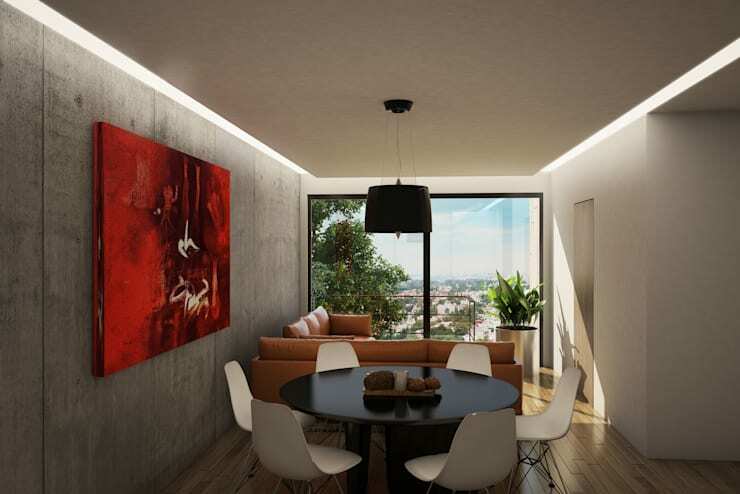 The exposed concrete walls are different yet attractive, while the large window allows natural light to bathe the room in cosy warmth throughout the day. The modern bathroom is filled with brilliant illumination, sleek appliances and glazing. 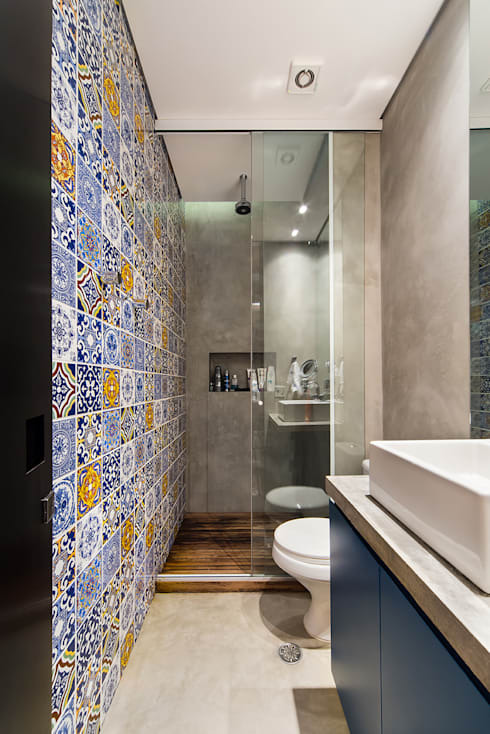 This bathroom includes some gorgeous Arab inspired tiles for colour and elegance, adding a distinguished and special appearance to an otherwise simple space. When decorating a small home, planning the layout of the environment is important. Look at ideas that be consistent in the living room, dining area and kitchen and includes the décor without extra furniture and walls that will limit or clutter the space. Neutral colours will go a long way in any home, and can be paired with a vibrant shade for those attitude loving days. Just because there aren’t any windows in parts of your small home, doesn’t mean that you shouldn’t consider other forms of décor for your walls. A dramatic mural is an interesting way to add a unique effect into your home, and when paired with neutral colours, a fireplace and chic romantic lighting, the interior will be instantly cosy and comfortable. If you enjoyed this Ideabook, then consider these: 18 staircase designs that will look fabulous in small houses. How have you decorated your small home in style?